Hello I'm Danielle Wiltshire and I am currently in my final year at the University of Portsmouth studying on the specialist course BSc Television and Broadcasting. One of the things I love about my course is that the academics involved are always striving to be ahead of the curve with teaching, and they care greatly about what aspects of industry practice need to be in the curriculum. For example, IP is now regarded as one of the serious futures of broadcasting, I got the opportunity to set-up a proper outside broadcast as part of my final year project. Another thing I love about my course is that there is no preconceived attitudes to gender regards the subject matter of Film, TV and broadcasting. Outside broadcast and technology may well have been dominated by men many years ago, but hopefully that's beginning to change. When you have a course that promotes multiple skills for all roles for both genders, this is perhaps one way this in-balance can be addressed. On the subject of IP and broadcasting, I do find it fascinating how the compromise of broadcast quality and bandwidth has been so carefully designed. My course is fortunate enough to have its own satellite uplink system, thus allowing us to broadcast from virtually anywhere using IP. My role for my final third year project is to determine the correct protocol for how OB's should be set-up and operated. Going live to the web would seem to be one of the most requested scenarios in broadcasting today, and that is what we do here at the University of Portsmouth via the weekly broadcasts of the Creative and Cultural Industries (CCI) Television Channel. 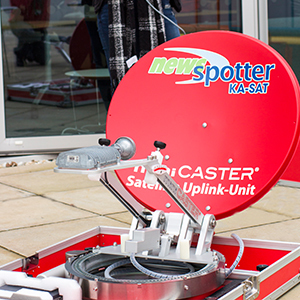 We have managed to deliver hundreds of broadcasts around the campus, and now thanks to the Minicaster Satellite system, we book air time with dedicated bandwidth and a guaranteed upload speed of 10Mbit/s. My learning journey at the University is nearly at an end, and I am confident that I leave well armed with relevant information, and the ability to face my chosen career path with a wide and varied experience. My name is Oliver Ray, and I'm also a TV and Broadcasting student, and to continue the subject of streaming I'd like to discuss how its all changed so dramatically over the last 12 years. The way that we all connect online has changed massively since I was even born back in 1995, and nowadays even the way that we share our lives with people has changed. Video sharing and streaming has changed the way we consume and view any content forever, and for two of my taught units I have been exploring the world of online streaming and video sharing. Through exploring this relatively new online world, I have learnt that different factors of traditional media have impacted the way we stream online. The fact that a crew of people are perhaps no longer needed to create an audience friendly video has created a different way for people to enter the video industry. Some individuals have become online stars in their own right and many are their own director, producer, camera, lighting and editor. Indeed most of the people I interviewed for my final year project did it all! They can create what they want, whenever they want; they are their own boss. Without platforms such as YouTube and Twitch many of us would of never have seen a funny cat video, a viral video or tutorials on new equipment and software. Many of these types of videos might not be to everyone's tastes, but there is no denying that they resonant with huge audiences. Whatever you may think about these individuals running their own channels, I must say that my perception of them has changed greatly since talking and meeting with a few. I had convinced myself that the ¢YouTuber' life was an easy road to success, fame and fortune. However, I've since witnessed what they have to endure daily, and it is mind blowing! The commitment and passion that these people show just to get ten views, a hundred views, a thousand views, or a million views is just phenomenal. The YouTubers that I have connected with have already sacrificed so much of their lives to create videos for other people. Of course there is personal gain for anybody wishing to pursue such success, but many do it to help others get through hard times, alongside those that do it for entertainment, or just to voice opinions and show off their work. Consequently video streaming services such as YouTube and Twitch have allowed everyone in the world to have voice and express who they are; all through the power of thing we call the internet. My university course has really helped me explore the worlds that exist on either sides of the camera, and my understanding of broadcasting and narrowcasting. When I use Avid to produce a VT, I'm now thinking about what my VT will look like within the television show, and what it looks like to an observer in another country. Even our use of YouTube channels has opened up our university CCI TV Channel to brand new heights. These video sharing and streaming platforms are exposing the Creative and Cultural Industries (CCI) Faculty to the world and to think that someone in another country has sat and watched a VT that I have edited is amazing! The online streaming world is changing all the time, with new additions to websites, to brand new streaming platforms and mobile apps, and it is very exciting to be part of a generation that is right at the forefront of such change within television and online viewing platforms.